Something I have to remind myself to eat is sources of B vitamins. When I look at my diet I realize they’re there but B vitamins are too important to miss. I’m a big fan of a good sprinkle of flake nutritional yeast (a terribly underrated seasoning) or a big glass of kombucha but today we’re revisiting a spread whose cousin starred in a favorite 80’s tune by Men at Work, “Down Under”; not Vegemite but Marmite! Vegemite was originally refined from a waste prodct. The yeast had done it’s job of fermenting wort into beer and would be thrown away as garbage. Cyril Callister was charged with converting this nutrient rich sludge into a highly nutritious spread. 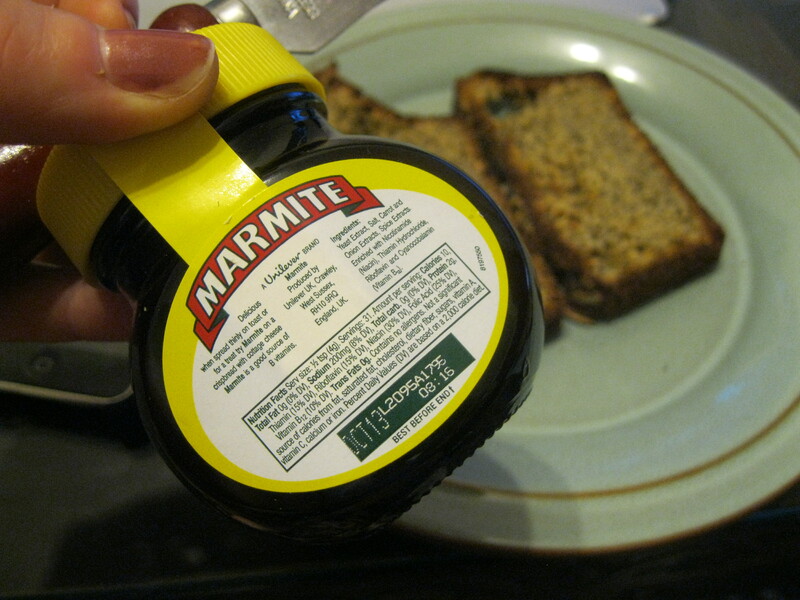 Apparently it worked because this stuff (and it’s competitor, Marmite) are available all around the world. Brent and I gave it a go with some bread I made Sunday. The bread was nutty and lightly sweet so it went well with the savory flavor that Brent noted had a hint of pine. I understand that a more traditional preparation involves butter so we might have to give it a go with some Earth Balance spread but until then we’ll be revisiting this gem for weekend brunches. On Thanksgiving I had my first tiny bite EVER of Vegemite. Not bad at all! I think it would make a great ingredient – much like miso – when you want a salty, rich flavor.